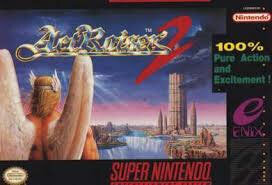 ActRaiser 2 for Super Nintendo is the sequel to the strategy/action sleeper hit from Enix. ActRaiser 2 is filled with even better graphics and more sword-slashing action than the original. Despite the god-game aspect of the game being dropped, ActRaiser 2 still retains the sidescrolling action scenes we are familiar with.